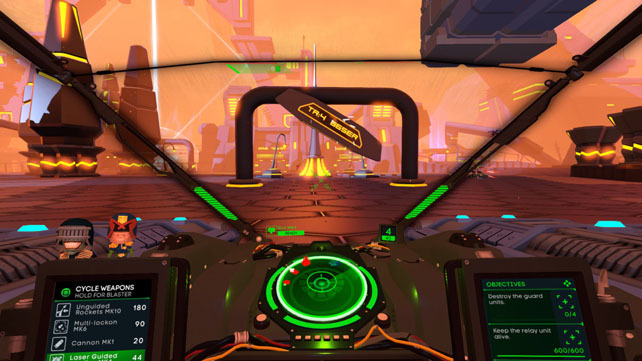 Battlezone has been out on the PSVR, Vive and Oculus Rift for a while now, providing tank based action for those with the requisite hardware. 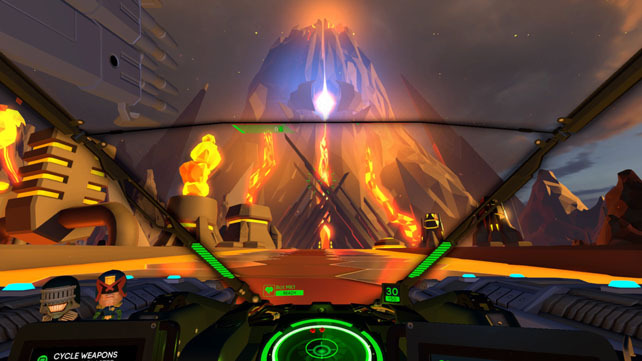 With very little warning, Rebellion have updated that game to the Battlezone Gold Edition, which effectively patches in the option to play without VR kit and enables the game to be played like any other title. 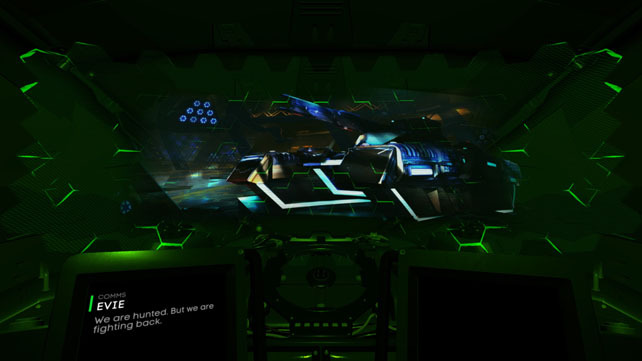 Given that one of the USPs of it is being immersed in a VR tank cockpit whilst fighting for dominance against an enemy AI (a scenario that’s particularly suited to the headsets), can it offer a compelling experience if it simply sticks to two dimensions? 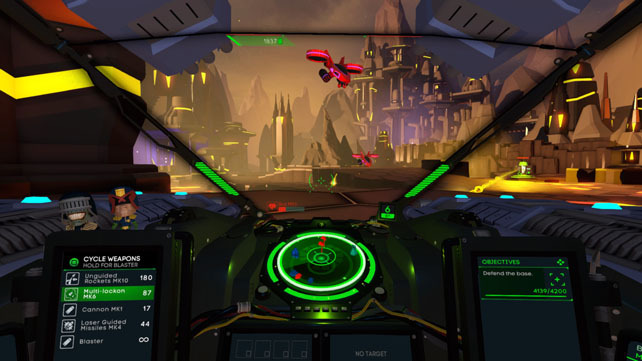 Battlezone brought us an update of a 1980 Atari arcade classic that’s had a number of re-imaginings over the years, but now rests squarely in Rebellion’s hands after they bought the rights a few years ago. The evolution of virtual reality has let them bring what was arguably the first VR game in arcades full circle: where now you can put your face into a headset to become a tank commander in a world of geometric shapes and blast anything that moves. The principle is the same as nearly four decades ago, but the execution is vastly different with fully realised futuristic arenas playing host to the combat. 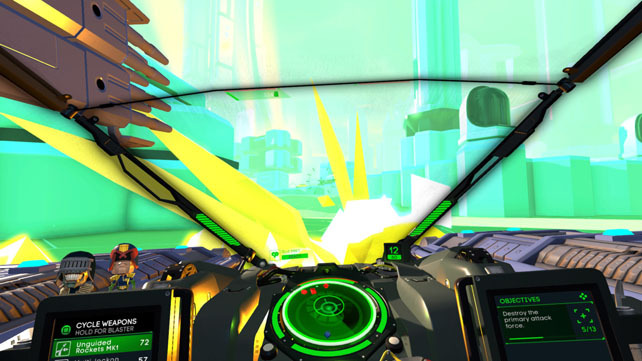 In a strange kind of parallel, the Battlezone Gold Edition is to the Vive and PSVR what the original arcade game was to the Spectrum and its brethren… a like-for-like version for people to play at home, just without all the bells and whistles of 3D. All the content from the original release is in there, along with the DLC that added cosmetic features, with the main draws being the campaign and multiplayer modes. There’s a loose story where the world has been brought to the brink by AI, and mankind’s last hope is in the people who live underground that remotely control tanks on the surface. The aim is to clear a path to the AI core, taking on optional missions along the route that might help the effort to wrestle freedom back for humanity. 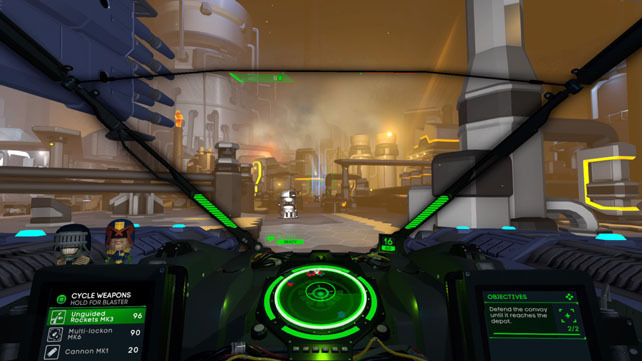 Picking a zone from a randomly generated hexagonal grid sets an objective and loads the pilot into the cockpit ready to do what they do best. Clearing a zone makes movement around the map easier (it’s a one tile at a time affair), and tackling out of the way objectives provide bonuses or makes things easier later. However, it’s counterbalanced in that the longer it takes to get to the core, the more nemesis machines are released in the map, making things a whole lot harder if they decide to get in the way. It’s a nice way of setting up the combat trials that make up the core of the game. Whichever arena you’re dropped into, the task is usually destroy anything that’s red and maybe hack something that’s white. Any other colour is typically just scenery to hide behind, including your blue teammates. Fortunately, blowing things up is what Battlezone Gold Edition is all about and you can set about it with aplomb once the tutorial is complete. Everything plays out like a first person shooter (so it doesn’t try and make you learn tank controls), giving a nice smooth feel to the movement, and one that’s more responsive than having to rotate bodies and turrets around to get anywhere. Weaponry is varied and needs cycling through to find the right one for each enemy type. The stock unguided rockets do their job very well, and you’ll have lock-on capabilities from the off to deal with flying annoyances, but it takes a few rounds to earn the credits to spend on more exotic items like railguns and laser guided missiles. However, simply owning a normal cannon that makes you consider range and shell drop can be one of the most devastating to use. It takes a bit of practice to hit enemies cleanly at distance and put me in mind of Sniper Elite on more than one occasion. Earning money to spend on upgrades is a big part of making the tank more powerful, and, depending on the type selected at the beginning, it will help define a particular play style, the basics of which will probably be worked out by the time the campaign is finished. It’ll take a lot longer to get the most out of the upgrades though, multiple successful missions are needed to get the credits as well as understanding and achieving the unlock criteria. Then there are the passive upgrades to improve like shield strength and regeneration or reload speed, again bought with the same credits earned from defeating enemies or hacking certain buildings. Each level usually has something to investigate, denoted by a white marker on the minimap, and being in close proximity triggers a connection that will siphon resources from them. It’s an optional extra that helps progress a bit quicker, but isn’t essential in the easier difficulties. You’ll want every advantage you can get when the opposition ups their game. The switch out of VR and into 2D actually isn’t as jarring as expected, and the full visual affect of the environments come to the fore. Whilst donning a headset gets you the “in the world” feel, they’re not up to the visual fidelity of an HD or 4K TV, so seeing what Battlezone Gold Edition looks like at a higher resolution is a treat. Everything’s sharper, crisper and cleaner, and stays at a solid framerate throughout. A nice inclusion is using the touchpad on the PS4 controller to look around the cockpit interior so you’re able to take in the detailing that’s gone into them. Sound is lovely too with the directional audio working well across a surround setup… not something that always translates well from the 3D audio in the VR games. Menu wise it’s a basic presentation, function being chosen over form, but then do you really need more in a game that’s wanting you to fire massive ordnance at the enemy? It’s about jumping in and taking on the AI or humans depending on what mood you’re in. The entire campaign is playable in co-op with up to 4 others, and there’s a plethora of game types available to blast each other to pieces if you’re not feeling particularly team-focused. 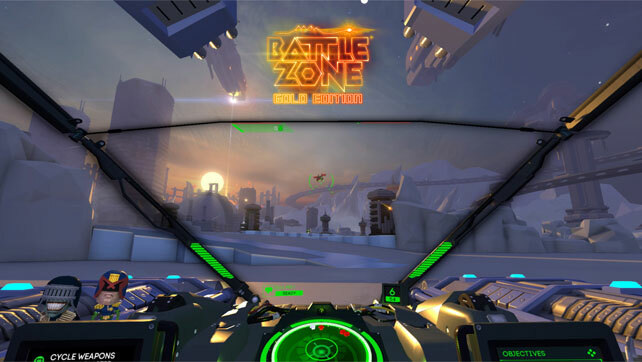 By changing the game to be both suitable for standard and VR players, Battlezone Gold Edition has opened up a new market (quite literally for the Xbox One version) and spread itself far and wide. It gives more gamers the chance to try manoeuvring around psychedelic environments whilst dodging incoming shells and trying to line up the perfect shot. There’s enough excitement and a different feel that makes it work as a unique game – something that’s odd to say especially when the 40 year old original is bundled in as well as an extra mode. It won’t be to everyone’s tastes because it is a one trick pony, yet it does it so well, and keeps the pace up, that you find yourself getting pulled along in its tracks rather than having to drive it forward. A PS4 review copy of Battlezone Gold Edition was provided by Rebellion’s PR team and the game is available now for around £30 on PC, PS4, Xbox One and coming soon to Nintendo Switch. … and rating 8 is for a VR version ? Kinda applies to both – the gold edition is the non-VR patch so has been reviewed based on that. However, it’s the same game as using VR. Does it mean that it’s not better in VR ? PS. I haven’t played it myself. The VR is more immersive, but induces nausea quite quickly because of the vehicle motion, so ends up being short play sessions. The gameplay doesn’t really change much as it’s still all done from the tank viewpoint and using the same targeting systems. I found it just as enjoyable to battle away in 2D, so would say (for me at least) they rate the same, it’s just nice having the option to choose either one.